My last post was a week ago, but been busy and I totally forget that I have the App on my phone.. sad. Ok, so my week so far was really, truly busy! Thankfully I passed all that, but then the hospital visits started! ._. then yesterday I had a physical Therapy but had too much work and was late for it… and missed it. Today I have an MRI cuz the last one was cancelled, but I totally forgot that I should be fasting. I didn’t, but I did Drink my morning Tea. so I called to make sure if it was ok or not, and they say my phone was off, which wasn’t.. ._. On the Pro side for today though, I’m visiting my family after work and will have lunch with them, and later my husband will be back. Anime and Manga~ Attack on Titan! Back to work and in better health, but for some reason i’m not in my usual mood; you know like feeling…. tired and blank? Been watching Shingeki no kyojin, special episode? 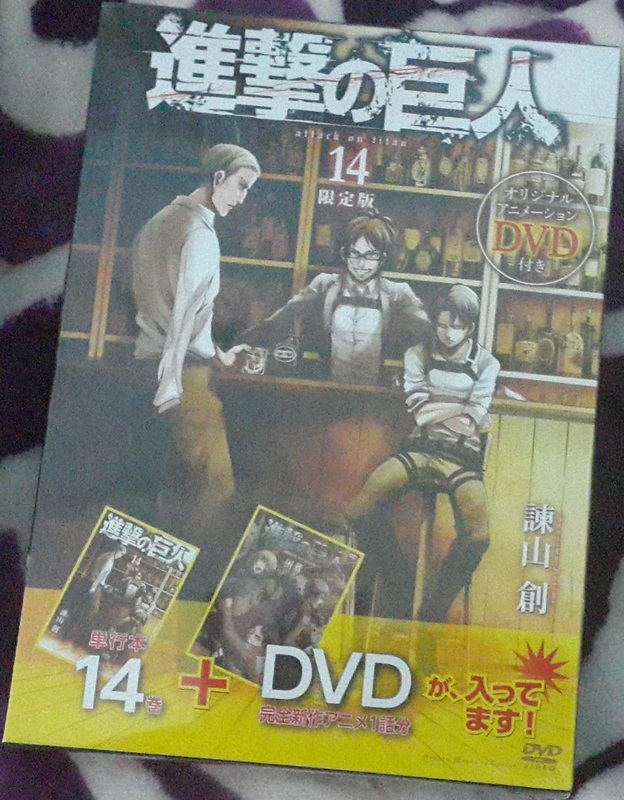 It comes as a DVD and Vol 14 of the manga (Japanese). Later we continued watching old anime that we used to watch as children. And finally downloaded Heidi, Girl of the Alps!